Could This Jacket Keep You From Catching a Cold? Whether you are a germaphobe or not, taking crowded public transit can expose commuters to a bevy of germs each day. The new Germinator Transit Jacket by Betabrand is a wearable germ block that can effectively help commuters avoid their neighbor’s colds and other sicknesses. Designed by gravitytank, the hooded jacket is lined with antimicrobial fabric that traps germs before they can reach your skin. Each cold season, coughs, sniffles and sneezes on subways and buses pass along bugs to unknowing commuters. With this in mind, Betabrand has created a literal shield against catching this season’s colds. The Germinator Transit Jacket looks just like any regular hooded coat, but its blocking powers can make for a healthier season. The water-resistant fleece first blocks incoming germs with a silver-infused antimicrobial fabric on the cuffs and collar of the coat, which inhibit bacteria growth with special nanoparticles. If germs bust through the first line of defense, the jacket is lined with more antimicrobial fabric for trapping bacteria and grime. The lining can be removed and washed to get rid of germy build up. As if the anti-germ linings were not enough, the Germinator Transit Jacket is also designed with extendable sleeves, to protect hands from grimy subway poles, as well as a high-lined collar to block your face from incoming coughs. The well-designed jacket will help commuters stay healthy and fashionable this season. Whether you are a germaphobe or not, taking crowded public transit can expose commuters to a bevy of germs each day. 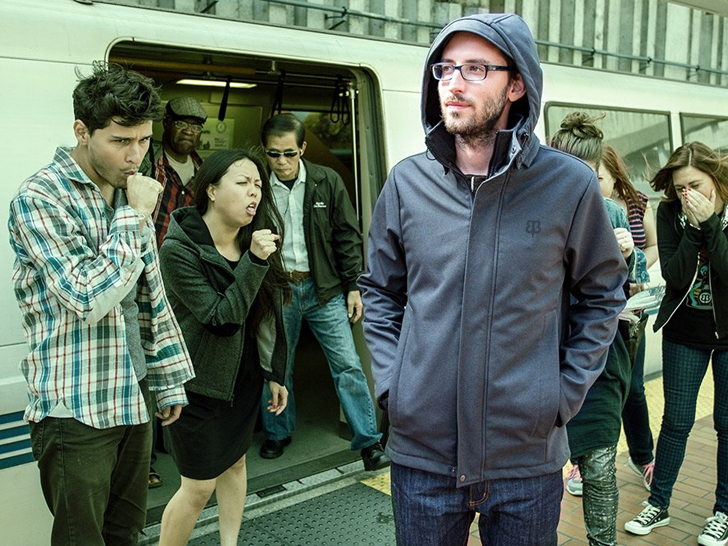 The new Germinator Transit Jacket by Betabrand is a wearable germ block that can effectively help commuters avoid their neighbor�s colds and other sicknesses. Designed by gravitytank, the hooded jacket is lined with antimicrobial fabric that traps germs before they can reach your skin.